• Fully ground spotting insert, for 60 degree spotting and engraving. • Utilizes standard NC Spot Drill holders, also can fit with WSP insert (combined spotting and chamfering 145°+90°), PR insert (create 60° center holes similar to DIN 332 Form R), CT insert (application for spotting, chamfering ) and corner rounging insert. • Excellent tool for grooving. Saving machining time! Applications: For spotting, engraving, small grooving on milling machines, machining centers. 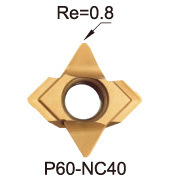 -NC40 : P35 grade, for unhardened steel & cast iron.